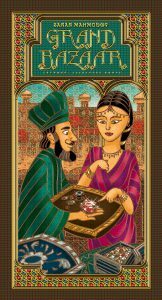 Grand Bazaar is a trading game for the family in which players are merchants who want to increase their initial starting capital by buying and selling three types of gems: sapphires, rubies and emeralds. It can be played by 2-7 players aged above 8 and one game lasts in 30-45 minutes. In more detail, the game lasts 27 rounds. Each round, prices for each type of gem may increase by 1, decrease by 1, or stay unchanged. Players must buy cheap gems to sell them at higher prices later, but this is all about probability and reality as well. To win, you have to diversify your stock, but you are limited on initial capital and the number of gems in the bazaar is limited as well. The first player changes each round clockwise, giving all players equal chances to plan their moves and make short- or long-term investments. At the end of the game, the player with most money wins!